A friend of mine commented my last blog post: Dandelions, I learned when I began teaching outdoor ed, are not native to North America. The settlers brought them here, because they didn’t know what kinds of greens would be safe to eat here in the New World, but they knew they could eat the greens of dandelions in the spring, and they were prolific. They’re prolific alright. Thank goodness the bees like them, otherwise they’d have one less redeeming quality. 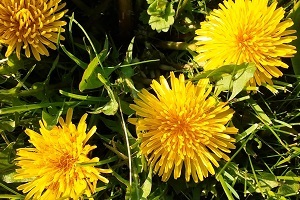 Although I confessed my love for dandelions last week, I understand why others dislike them. Dandelions show up in one spot and, if not dealt with properly, they show up in other areas. They invade and take over until everything is infested. They’re hard to get rid of and seem to always return no matter what you try or how successful you think you are at getting rid of them. Cancer’s a lot like dandelions. If not treated, the malignant cells multiply and show up in unexpected areas. No matter how successful your treatments are at getting rid of them, the abnormal cells often return with a vengeance. Cancer happens so the works of God might be displayed in us. I’ve said it before and if time continues, I’ll say it again and again. God reveals many of His magnificent attributes to us during times of crisis. One of the most rewarding experiences I’ve had to date while going through this cancer journey is God’s peace. It enveloped me during my chemo treatments, like the calmness in the eye of the storm. It sustains me now. When I feel overwhelmed about “what ifs,” the Lord reminds me of His peace. He didn’t calm the storm. 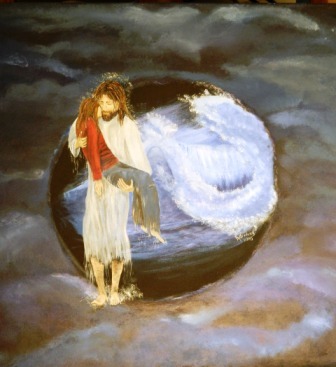 He carried me through it. He’s not going to leave me now or ever. How about you? What has God taught you during your storm? This comment is a little late, but hope it helps someone. Storms usually contain strong winds and some kind of precipitation.In my life, strong winds blow away my distractions from God. The precipitation nourishes what God is trying to get me to understand. Sometimes, I grasp what I’m to learn quickly. Sometimes, it takes time. No matter, even though in my mind, I feel like God stepped away from me. I can look at scripture and know He hasn’t. Good insight, Joan. Thanks for sharing.